Bird of Paradise Pose is an awesome standing along with balancing pose. In Sanskrit Bird of Paradise Yoga pose is known as “Svarga Dvidasana”. In Svarga Dvidasana, Svarga stands for Heaven (According to Hindu Mythology the God Indra is the king of Heaven), Dvi represents two and the meaning of Asana is a seat, Pose or Posture. Bird of Paradise Pose directly targets your groin, hamstrings and improves your balance. Bird of Paradise Pose is an ideal posture for practitioners at an intermediate level. Position: – Standing and balancing. First start the Svarga Dvidasana, by taking the position of Utthita Parsvakonasana (Extended side angle pose). Now, turn your head and set your gaze towards your front foot. Keep your back foot forward in a way that your feet are equal to the front of your yoga mat. After this, you have to maintain the bind during the pose. You may also keep your feet few steps ahead to get your back foot in a forward direction. Next, you are in the position of forwarding bend during this wrapped your arms around one leg. Make sure that, both of your knees are slightly bent. After that, shift the body weight to your other leg (that leg which is not bound by your arms) and stand strong and maintain the balance on your unbounded leg. Now, raise your other foot from the floor/ground. 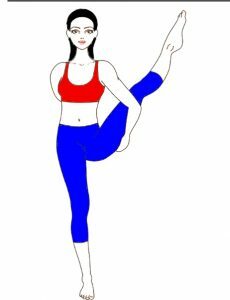 Gently try to stand up to bind and lift your bounded leg up along with you (bring yourself up along with your bounded leg). After that, try to maintain the balance on your one leg in standing position. Try to extend your bound leg as much as you can. Set your eyes on to your alternate shoulder (That is far from your extended leg). This is the final position; remain in this pose for few seconds. For discharging the pose, slowly bend & lower down your bounded leg to the ground/floor (don’t open the bind). Once your bounded leg touches the floor, you are in your initial stage. Now, free your arms relax for while and follow the same steps with your other leg. Bird of Paradise Yoga pose is not an easy to do Asana, so that’s why it comes under the intermediate category. Whenever you feel difficulty then release the bind immediately. Remember one thing; you can’t perform this Asana correctly in only one attempt. So, you have to keep some patients. You can also take the support of a wall or use the strap in place of binding your hands. If you feel some pain in your shoulder and knees then try the same pose in the sitting position (lift one leg along with bind your other leg). If you don’t want to carry on then grab the shin of your lifting leg in place of binding also keep the knee of your binding leg bent (This variation is for standing position). 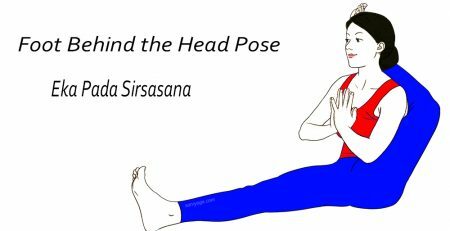 Those practitioners, who have tight hips and facing some difficulties during the pose, then perform the supine version of Supta Padangusthasana (in this, you feel less strain). Bird of Paradise is best for opening your hips, groin and your hamstrings. Svarga Dvidasana stretches & strengthens your legs. Awesome pose for improving the balance. Gives also a good stretch to your arms. Beneficial for your knees also. You have to breathe deeply in each and every step of Bird of Paradise Yoga Pose. Svarga Dvidasana complex Yoga Pose for beginners so doesn’t challenge yourself if your body is not flexible and strong. Svarga Dvidasana needs strength and balance. So, if your strong and having a good balance on one leg then go for it. In case of knee, shoulder, leg or in hamstrings issue avoid this. If you easily perform a basic level of Asana then attempt this. Beginners should not attempt this Asana without practicing the basic level of Asana. Be careful during maintaining the balance, don’t injure yourself. For balance you can take your friend’s help. One and most vital thing, Perform all the Yogic activities in under the supervision of an expert person. Because Yogic activities needed guidance; follow the steps and perform it in a correct manner. Wrong steps or performing incorrect posture may harm your body.